"Slightly unusual. Unusually good." That is Chebe's motto. Pronounced chee-bee, it is a unique bread product based on the Brazilian pao de queijo (Brazilian cheese bread) made primary of manioc/tapioca flour and starch. Anyone who tries this bread instantly gets hooked on it. The texture is soft and chewy with a light and crisp exterior, but unlike any bread you have ever had before. The taste is clean and versatile. I was first introduced to Chebe bread about five years ago when I attended a Cincinnati Support Group pot luck lunch. I never had anything like it before. So chewy, tender, doughy, and delicious yet crispy on the outside. Since then, Chebe has become my first choice for bread in form of whatever go best for what I am making: bread rolls, bread sticks, naan, focaccia, baguettes, pizza, crackers, even for pigs in the blanket or beef wellingtons. Chebe has tons of recipes on their web site. So when people ask me, "If you can't bread, what do you eat?" I happily say "Chebe." It is bound to be everyone's favorite bread regardless if they need to eat gluten free or not. Preheat oven to bake at 400F. In a medium/large bowl, mix the eggs well with a fork. Add in the olive oil, the herbs and mix well with the fork. Add in the stock and cheese and mix well. Add in the Chebe packet slowly, and baking powder if using the red packet for extra rising. Mix with fork until all the powder is incorporated. Using a tablespoon or a small scooper, portion out the bread rolls. Roll. Lightly dust with tapioca flour. This helps to puff up the bread more. Bake for 8-10 minutes until a very light gold color. For best results, bake on a pizza/baking stone. "Wow! These are the best peanut butter cookies I have ever had!" "No gluten? Who needs gluten when they taste like this?!" You will be saying this when you taste these cookies, just as my friends and family tell me over and over again. The simplicity of these peanut butter cookies are what make them so irresistible. When I first starting formulating the ultimate gluten free peanut butter cookies, I worked with a combination of different flours like white/brown rice flours, buckwheat flour, and tapioca flour. The peanut butter flavor was diluted. I conducted recipe research on different peanut butter cookies. One that looked promising was a flourless peanut butter cookie. Why have flour, butter, and like when you want the primary flavor to be peanut butter? It was super simple with a 1:1:1:1/cup peanut butter:cup white sugar:tsp baking powder:egg. I made this recipe and it was good; but I felt it needed optimization to make it perfect. It needed brown sugar to add a molasses, rich sugar character; an extra egg white to add some drying properties to the oil in the peanut butter and add in additional protein; add in ground peanuts to give some needed body to these cookies. With the eggs and no flour, there is no need to the leavening, so I lastly removed the baking powder. Over leavening will result in a deep dip in the center - not good. Lastly the method for making these cookies, the processing, I have simplified for guaranteed results. The finishing of these perfect peanut butter cookies proved to be non-committal, hence peanut butter cookies done 3 ways: rolled in sugar and fork pressed; PB&J; and peanut butter + chocolate. All = yum! Preheat oven on bake to 325F. Using a food processor (I use a mini-prep size), add in the white + brown sugars + roasted/salted peanuts. Process until finely ground and homogeneous. In a medium/large bowl, using a fork, scramble the 1 whole egg and 1 egg white. Add in the sugar + peanut mixture and blend with fork until uniform. Add in peanut butter and mix until just mixed evenly. Warning – do not over mix or the oil will start separating out. If the batter is too soupy, let sit for several minutes to thicken. Now it's time to finish it 3 different ways! Put 1/2 cup granulated white sugar in a small bowl. Using a #70 scooper (a very small ice cream scooper), portion out each cookie. Roll the dough in a ball and coat in sugar, or put the scoop of batter into a small bowl of the sugar and roll around until coated. Put onto parchment paper on a cookie sheet or cooking stone and cross-mark with a fork (12 cookies/sheet). Bake for 10-12 minutes, until lightly brown on edges. Sprinkle with a little more sugar fresh out of the oven for a more sugar-frosted effect. Cool on rack. Using a #70 scooper (a very small ice cream scooper), portion out each cookie. Put onto parchment paper on a cookie sheet or cooking stone and press a dip in the center of the dough with the backside of the scooper or your clean fingers (12 cookies/sheet). Bake for 10-12 minutes, until lightly brown on edges. Cool on rack. Heat your choice of Jam/Preserves/Jelly on the stovetop (~ 5 min) or microwave (30 seconds). Be careful! Allow to cool slightly, using a small spoon, stir until it thickens a bit. Place a spoonful in the dip of each cool, careful in not overfilling the dip. In a microwave safe bowl, weigh out 2 oz Semi-Sweet Chocolate Chips + 1 oz Creamy Peanut Butter. Microwave on high for 45 seconds. Stir and if not completely melted, heat for another 30 seconds or less. Stir until homogeneous. Place a spoonful in the dip of each cool, careful in not overfilling the dip. I needed to make an appetizer for a foodie event. I wanted it to be fresh with a lot of vegetables. Something light; I was envisioning an encapsulated salad. Hm, how to do that? The first obvious thing that came to my mind was in form of an Southeast Asian style spring roll. After officially being trained at Smart Cook Thai Cookery School and honing my knife skills, I felt confident in making a sizable batch of these perfectly fresh, gluten free and milk free finger foods. There are a couple of tricks to make these spring rolls with ease: preparation and assembly. Preparation of the vegetables is the first step in efficient spring roll making. The smaller the cut of the vegetables, the better. The ideal cut of the vegetables is julienne - 2 inches long, and 1/8 inch by 1/8 inch. I thought it would be best to make a thick sauce and put in on the inside of the roll as opposed to having it on the side. Let's talk about ingredients. Most importantly, you will need those round rice spring roll wrappers that are dry. To hydrate them, have a roasting/baking pan filled with warm water. The sauce I made from Panda Brand MSG Free (and gluten free) oyster sauce, brown sugar, ground peanuts, lime juice, finely chopped kaffir lime leaves, and chili paste/sauce. The filling comprises of mostly vegetables and herbs. I used what I found at the store and what looked best. 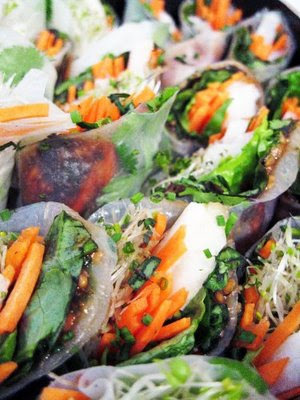 For these rolls I used bib lettuce, carrots, radish sprouts, jicama, chives, mint, and basil. Looking at this recipe in the Smart Cook Thai cookbook, they call for minced tofu, glass noodles, bean sprouts. It is totally up for intrpretation, but try to keep it simple and differentiated in color and texture for a super impressive roll. Making an efficient assembly line is kind of fun and makes the spring roll production a lot easier. In the chef world, we call in mise en place. French for "everything in it's place." In the center of my workspace is my large cutting board with a towel underneath to prevent slippage and a damp towel on top for a moist workspace for assembling and rolling. To the left: the stack of rice spring roll wrappers and large roasting pan of warm water - only put in one wrapper at a time. Then, above your cutting board, place all the veggies and herbs, as well as the sauce. The wrapper needs about one to two minutes of soaking to soften completely. The wrapper is the most difficult part of making the rolls. It takes practice to figure it out; do not be discouraged if you rip them. It is bound to happen to the best of us. Once the wrapper is completely softened, carefully grab it at the 10 o'clock and 2 o'clock positions and bring it to the center of your prepared cutting board and lay it down as smooth as possible. Now put another wrapper in the water. Time for assembly. Place a small amount of each ingredient towards the bottom center in a tight line. A tip to note: place a very small amount of sauce on the hardest ingredients like carrots so it does not get too soggy over time. Then fold up the bottom part of the wrapper to cover the filling. Fold in the sides, and carefully and snugly roll it up completely. Now your off to repeat to make more rolls. To serve it, I cut it on the basis and served in upright for a colorful presentation. Give it a try! It may be frustrating at first, but the results are worth it.